Derren Brown returns to our screens with â€œThe Experimentsâ€ a brand new four part series for Channel 4. Each stand-alone episode asks and answers a single question featuring the usual inventive and jaw dropping Derren Brown mixture of stunts, suggestion and thought-provoking entertainment combined with tried and tested psychological experiments, to illustrate how easily our behaviour can be manipulated. In â€œThe Gameshowâ€, the second show in the series, Derren Brown turns himself into the host of a game show and investigates whether we all have the capacity for evil and whether or not being part of a group affects our sense of right and wrong? The Experiments â€“ The Assassin (Episode 1), airs Friday 21st October at 9pm on Channel 4. The Experiments â€“ The Gameshow (Episode 2), airs Friday 28th October at 9pm on Channel 4. “This October, the extraordinarily talented Derren Brown returns to our screens with his new series, Derren Brown: The Experiments. The four programmes see Derren attempt some of his most ambitious and dramatic work to date, and the series promises its usual heady mix of mystery, shocks, thrills and jaw-dropping moments. Your new series is Derren Brown: The Experiments. Whatâ€™s the concept? The concept is experiments, I suppose! They are four sociological experiments, some of them rooted in existing experiments that have been done before â€“ although re-envisioned â€“ and others are things that Iâ€™ve created myself. Three of them are relatively dark, looking into the darker side of human behaviour, and one of them is rather positive and jolly. Are you allowed to talk about them in any detail? Yes. The first one is called The Assassin. Itâ€™s whether or not itâ€™s possible to hypnotise somebody to kill, to carry out an assassination. This is based on the testimonies given by political assassins who say they were brainwashed by the CIA. Itâ€™s taking some of those apparent and apocryphal techniques and seeing whether they could actually work in real life, or whether theyâ€™re just movie, fiction stuff. So somebodyâ€™s being programmed, they donâ€™t know what theyâ€™re heading towards, and then it culminates in a staged public assassination of a celebrity. I take it weâ€™re not allowed to know who the celebrity in question is? If they did go and carry out the â€˜assassinationâ€™, that would be quite a difficult thing for an individual to discover about themselves, wouldnâ€™t it? Yes. I canâ€™t say too much about it without giving away what happens. But itâ€™s the nature of these things, as with many of the things Iâ€™ve done in the past, that people have to be handled very carefully. What we have in place is quite an elaborate process. So people apply to be part of the show, we get thousands of applications, and we go through the paperwork and choose a few hundred, and we had a big session in London where we just got everybody together. And then we discreetly picked a few that we liked, and got those people independently psychologically assessed. What normally happens is that after theyâ€™re happy that weâ€™re going to use them, we either call them up and say weâ€™re not going to use them, or we donâ€™t call them up at all. But they have no idea, obviously, whatâ€™s going to go on. So we have to ensure that theyâ€™re robust enough to go through it and be able to deal with it, while at the same time not giving them any idea of whatâ€™s going to happen to them. Itâ€™s very important theyâ€™re looked after, itâ€™s always been the case. Okay, so what else is lined up in the series? There is another one that investigates whether we all have the capacity for evil and how if when acting anonymously as part of a crowd, it affects our sense of right and wrong. This is looking into something called â€˜deindividuationâ€™. Itâ€™s sort of mob mentality. It ties in with internet bullying, which is often anonymous, and rioting of course, and football hooliganism, things like that. The subjects of the experiment are a gameshow audience â€“ people coming to what they think is my new gameshow. Theyâ€™re watching a gameshow where they get to make decisions about what happens to somebody. Theyâ€™re always given a positive and a negative option, and the audience are all given masks, so they have no identity. The experiment was to see what behaviour this would bring out. To see how malign they would be in their decisions? Exactly. Itâ€™s an experiment into cruelty, and how easily we can slip into that. Any audience that is prepared to believe youâ€™re going to turn into a gameshow host deserves what they get! [Laughs] It is a quite Derren Brown-y kind of gameshow, it was plausible. So you werenâ€™t just presenting Family Fortunes? No, it wasnâ€™t quite like that! It was quite a good gameshow, actually. If it wasnâ€™t purely that it was designed to give people the potential to act very cruelly, it would be quite a fun vehicle! Does if often happen that you make a show where you donâ€™t really know whatâ€™s going to happen? With previous shows Iâ€™ve always had a pretty clear idea of where Iâ€™m heading, but one thing that separates these from the other shows Iâ€™ve done is that they really are experiments. Thatâ€™s the nature of these shows. Over the years youâ€™ve moved from your shows being more about tricks and stunts to deeper areas. Why have you gone down that route? I think thatâ€™s just be growing up over the years. Magic, whether itâ€™s mind magic or conjuring, is about the cheapest and quickest way of impressing people, and I think if you donâ€™t grow out of that as a magician then it shows, and people get a bit sick of that after a while, because it starts to feel like posturing. So I grew out of it. Having said that, there are a few things a bit more like that in this current series, there are some little tricks in there. But essentially Iâ€™ve always been very aware of not doing the same things over and over again. A lot of these shows indicate how easy it is to manipulate human behaviour. Do you find that unsettling, what it says about human nature? Iâ€™m sort of fascinated by the reliability of it â€“ knowing that given the right conditions people will behave in certain ways. The show about deindividuation show absolutely ties in with things like the Stanford Prison experiment, in which people were put in a prison environment, and some were playing guards and some playing prisoners, and they were just allowed to get on with it. And it just brings out the most terrible, terrible behaviour in people. Itâ€™s horrendous what comes out. So itâ€™s about the darker side of human behaviour, but I just find it fascinating. It doesnâ€™t mean that weâ€™re dark and cruel people, just because in certain contexts it so easily comes out. It makes me think that we probably need to reassess the Twitter and blogging environment so that you canâ€™t do those things anonymously. You should have to out your face and name to what you say, and take responsibility for it. Clearly perfectly nice people can easily end up doing pretty nasty things â€“ I think the riots showed that. Itâ€™s not about blaming fathers or disenfranchised areas of society â€“ itâ€™s clearly just something in our nature, being able to behave as part of a crowd and not having to take responsibility. If youâ€™re an expert who can make people do stuff they wouldnâ€™t ordinarily do, shouldnâ€™t you be working for the secret service? [Laughs] We were discussing this today â€“ the implications of some of these things are very interesting. I just leave that to others, thatâ€™s not my thing. If other people want to make something of it and apply it in their own way, thatâ€™s up to them. Who knows, maybe this sort of stuff does go on. Itâ€™s brought me closer to a lot of the conspiracy theories around those assassinations and things. Thatâ€™s exactly the answer a genuine spy would have given! If itâ€™s not handled responsibly, can hypnosis have unwelcome effects on people? I donâ€™t use hypnosis very much anymore, although obviously I use it a lot in The Assassin episode. But I used to do stage hypnosis, and you start to see even there how, if you treat people badly, youâ€™re going to create problems. Itâ€™s not really that hypnosis is doing anything to anybody, particularly â€“ youâ€™re not putting stuff in their brain â€“ but itâ€™s just about peopleâ€™s psychological state. If theyâ€™re confused at the end as to whether theyâ€™re still under or not, and they resent being up there, then they could start to create all sorts of symptoms. Itâ€™s a delicate thing. In some ways itâ€™s misunderstood. If you went to see a band and then you came home and crashed your car, you wouldnâ€™t think of blaming the band, but if youâ€™d seen a hypnotist and you were looking for a scapegoat, thatâ€™s an easy thing to do. So it can get really misunderstood. At the same time, you have to take real responsibility for it. The show surprised me actually â€“ I was more sceptical about what hypnosis could or couldnâ€™t achieve than I am now, having done the show. And actually the experts were surprised by it as well. What have been your favourite shows that youâ€™ve done in the past? I really liked Heist, and that seems to be a popular favourite, but I think my personal favourite was Hero at 30,000ft, about the guy who ended up landing the aeroplane. That was a huge journey for somebody who is really transformed by it. And one of the really fun things about these shows is the lengths you go to. I ended up hiding in that guyâ€™s garage in his garden at 2am hypnotising him through a walkie-talkie that was under his bed. That kind of stuff is just fantastic. The sheer lengths you go to just to create an experience for one guy is, for me, the real joy of making programmes like this. I donâ€™t do a lot of these things, so when I do do them, my heartâ€™s really in it. Youâ€™ve got almost 900,000 followers on Twitter. Do you enjoy that forum? I do. I very much enjoy it. I recently discovered â€“ which has made me enjoy it even more â€“ a Twitter app that allows me to mute followers if they are being a bit exhausting. But they donâ€™t know that Iâ€™ve muted them. I donâ€™t have to block them, which would be rude. Thatâ€™s made life a lot easier, because there are some people who take that access that they have to you way too seriously. Youâ€™re quite a prolific tweeter, but also quite a private individual. How do you reconcile the two? In suppose you tweet when you want to. Iâ€™ll sometimes go a week or two without tweeting, and then when Iâ€™m in the mood, tweet loads, and clog up peopleâ€™s in-boxes. Itâ€™s a moment when you feel like sharing something. The odd thing now is, if you see a film or something happens and you form some sort of witty apercus pertaining to it, in a previous life you might just have told your friends or your partner or just kept it to yourself, now you get to share that little epithet with the world. Thatâ€™s a nice thing, if you think of something witty you get to tell many more people. Itâ€™s very satisfying. But itâ€™s been very tricky in the past, and Iâ€™ve nearly stopped it. The aftercare that comes with some people. It used to be the case that Iâ€™d do a show and then maybe meet somebody afterwards who was a fan, and theyâ€™d have a present and a message that theyâ€™d written, which is always lovely. That was nice, and if youâ€™d made them happy by having a chat with them, that was a lovely feeling to go away with. But now, the difference is often I know months before that theyâ€™re coming, because theyâ€™re constantly tweeting me telling me what theyâ€™re going to be wearing, and asking me if I give hugs, and whether they should ask for a hug or will I just give it to them. And then they give me the letter and the present, and then maybe for the next month theyâ€™ll ask me to send them a picture of where Iâ€™ve put the present in my house, and then am I going to reply to the letter and what were my thoughts on that. So it can be difficult, hence the mute button. But anybody in the public eye goes through that, itâ€™s part of it, the little tax that you pay for all the nicer aspects of it. Derren Brown returns to our screens with â€œThe Experimentsâ€, a brand new four part series for Channel 4. Each stand-alone episode asks and answers a single question featuring the usual inventive and jaw dropping Derren Brown mixture of stunts, suggestion and thought-provoking entertainment combined with tried and tested psychological experiments to illustrate how easily our behaviour can be manipulated. In â€œThe Assassinâ€, the first show in the series, Derren Brown investigates hypnosis and asks if someone could be hypnotised into a killing a celebrity. Is this really possible? And who will be the celeb? The Experiments – The Assassin, airs Friday 21st October at 9pm on Channel 4. I have, these past few months, been secretly ferreting away on a new series of four weekly specials (and theyÂ are specials) for Chanel no. 4. I have been up to all manner of no good, hiding out here and there and making people do all sorts of dreadful things. Trailers and whatnot will be emerging very soon, but I wanted you to hear it here first. 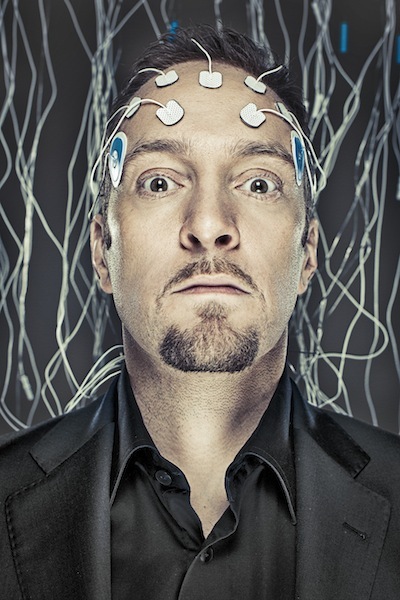 The shows are called Derren Brown: The Experiments. The â€˜Derren Brownâ€™ bit, youâ€™ll be immediately relieved, refers to me; the â€˜The Experimentsâ€™ part is what they are. Each special is an ambitious sociological experiment, in which the unwitting subject is a single person, a crowd, or even an entire town. Unlike previous shows, these are driven by open-ended questions. They are experiments into whether certain things are possible, or what would happen if certain situations arose, or how people might behave under certain conditions. Three of the four very much look at the darkest edges of human behaviour, and given that, Iâ€™m sure thereâ€™ll be all manner of complaints. I, meanwhile, am rather fond of them. Weâ€™ll be posting all information here on this site first. Details of the first show should be here tomorrow. The Experiments start on Friday, October 21st at 9pm, C4.